The White House is investigating whether Jared Kushner broke the law when he met with entities that later loaned millions to his family's company. President Donald Trump's adviser and son-in-law Jared Kushner might be in some hot water with the White House counsel's office. The acting director of the Office of Government Ethics says the White House is looking at whether Kushner violated any laws when he met with businesses that later loaned hundreds of millions of dollars to his family's company. 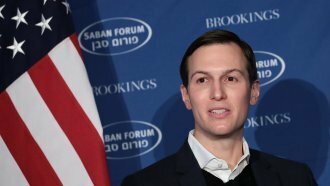 Citigroup and Apollo Global Management told reporters that yes, they loaned Kushner Companies the money, but they dispute the idea that their meetings with Kushner at the White House had anything to do with it. They said the funding was already approved and the CEO of Citigroup, who met with Kushner, didn't know anything about it at the time. The money was intended to go toward a development in Brooklyn. Now, in a response to a Democratic lawmaker's request for information about Kushner's role at the White House, OGE Acting Director David Apol confirmed those meetings are under the microscope in the West Wing's legal office.